hi mom! | doberman pizza. It’s such a beautiful day today!!! it’s sunny, the sky is clear and blue. birds are singing everywhere. Catherine and I went for a walk this afternoon and I recorded a robin singing. 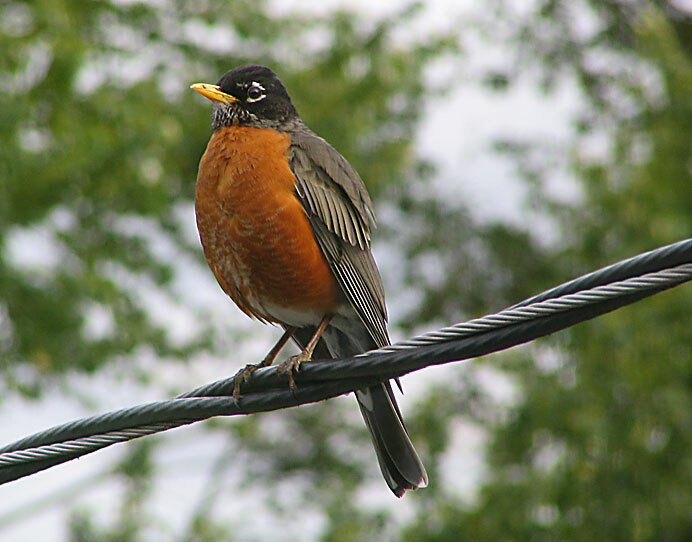 Robins sing so sweetly. And they’re beautiful too. ahhh spring. hmm, did you know that we’re in the middle of the Baha’i month of Beauty? The Baha’i Calendar consists of 19 months of 19 days, all of which are named after attributes of God. We’re currently in the third month: The month of “Jamál”, the Arabic word for “Beauty”. There’s a whole song that we use to remember the names of the months. That reminds me, I have to prepare for my time off at the end of this month. I’m taking a week off at the end of May, and I’ll be going to visit my peeps in Quebec. Holla back. It’s been a while since I’ve been back to visit, so this’ll be a well-deserved time to plug back in with my old friends up there. Oyez, oyez: C’est exact, je vais retourner au Québec pour un bout vers la fin du mois de mai et début juin. J’aimerais bien passer voir tout le monde. C’est dommage que je n’aie pas plus de temps pour faire tout le grand tour… pour le moment j’ai l’intention de passer par Trois-Rivières, Victoriaville et Drummondville. Si je peux bien planifier tout mon temps, ça se peut que je passe aussi par Sherbrooke. En tout cas, si vous voulez arranger quelque chose, faites-moi signe et on se jasera ça. Ça me ferait trop plaisir de revoir autant de monde que possible!!! This entry was posted in journal and tagged français, quebec, travel, weather by danger. Bookmark the permalink.